Louisiana’s next governor will face two important fiscal issues related to coastal restoration early in his term. 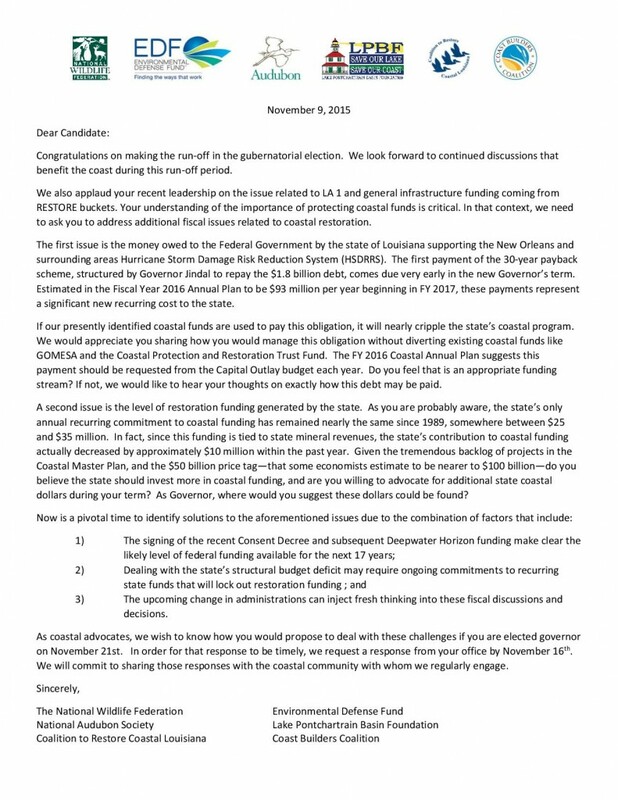 The Restore the Mississippi River Delta Coalition, in partnership with Coast Builders Coalition, delivered the below letter to both candidates on November 9, in which our groups asked the candidates to provide their positions on how they would handle two key coastal issues once in office. The first question involves the payback of Greater New Orleans Area Hurricane Storm Damage Risk Reduction System (HSDRRS) by the state of Louisiana to the federal government. Louisiana owes approximately $93 million per year for the next 30 years to pay off its debt. The groups asked the candidates how they might manage this enormous fiscal obligation. The second issue involves the level of funding generated by the state of Louisiana for coastal restoration. Since 1989, the state’s only annual recurring commitment to coastal funding has remained nearly stagnant between $25 and $35 million. Given the tremendous backlog of projects in the state’s $50 billion Coastal Master Plan, we asked the candidates whether Louisiana’s current contribution was significant enough to match the need and how and where additional funds might be found. Official Letter to Gubernatorial Candidates. Click to download PDF. Our organizations received official responses from both candidates on November 17. A PDF and the text of each response is shared below in alphabetical order. Click on each image to view/download the response letters. Official response from John Bel Edwards. Click to download PDF. In response to the questions you posed on Coastal Restoration funding I am providing the following answers and information. When I am governor you will always have a seat at the table as we prioritize our coast and return honesty to the state budgeting process. The first issue is the money owed to the Federal Government by the state of Louisiana supporting the New Orleans and surrounding areas Hurricane Storm Damage Risk Reduction System (HSDRRS). The first payment of the 30-year payback scheme, structured by Governor Jindal to repay the $1.8 billion debt, comes due very early in the new Governor’s term. Estimated in the Fiscal Year 2016 Annual Plan to be $93 million per year beginning in FY 2017, these payments represent a significant new recurring cost to the state. If our presently identified coastal funds are used to pay this obligation, it will nearly cripple the state’s coastal program. We would appreciate you sharing how you would manage this obligation without diverting existing coastal funds like GOMESA and the Coastal Protection and Restoration Trust Fund. The FY 2016 Coastal Annual Plan suggests this payment should be requested from the Capital Outlay budget each year. Do you feel that is an appropriate funding stream? If not, we would like to hear your thoughts on exactly how this debt may be paid. I do not support diverting existing coastal funds to repay the HSDRRS debt. Capital Outlay funds may need to be used to address some of this payback, but the state will need to address the HSDRRS payback as part of its structural budget reforms. My plans to address the structural budget problems so we can budget with honesty and integrity to meet all our obligations and priorities are available at www.johnbelforlouisiana.com . A second issue is the level of restoration funding generated by the state. As you are probably aware, the state’s only annual recurring commitment to coastal funding has remained nearly the same since 1989, somewhere between $25 and $35 million. In fact, since this funding is tied to state mineral revenues, the state’s contribution to coastal funding actually decreased by approximately $10 million within the past year. Given the tremendous backlog of projects in the Coastal Master Plan, and the $50 billion price tag—that some economists estimate to be nearer to $100 billion—do you believe the state should invest more in coastal funding, and are you willing to advocate for additional state coastal dollars during your term? As Governor, where would you suggest these dollars could be found? I look forward to working with stakeholders to ensure timely funding of coastal restoration projects. We have lost nearly 2000 square miles of coastal land mass over the last 100 years. The economic contributions of Louisiana’s coast exceed $20 billion per year. But much of this is threatened, including our fisheries, wildlife, tourism, oil and gas, and shipping and navigation industries. The Coastal Restoration Master Plan is a living document which must be constantly revisited through the lens of new and better science. Funding will soon be available in amounts that will be meaningful, including $100 million per year from the Breaux Act, $1.2 billion from the BP criminal fine, up to $200 million from GOMESA, $5 billion over fifteen years through NRDA, and another $787 million over 15 years through the Restore Act. But the estimated cost of funding coastal restoration is $50 billion over the next 10 years. I am fully committed to using these funds only for coastal restoration so that we can prove we are good stewards of our funding when we attempt to convince the rest of the nation to partner with us. 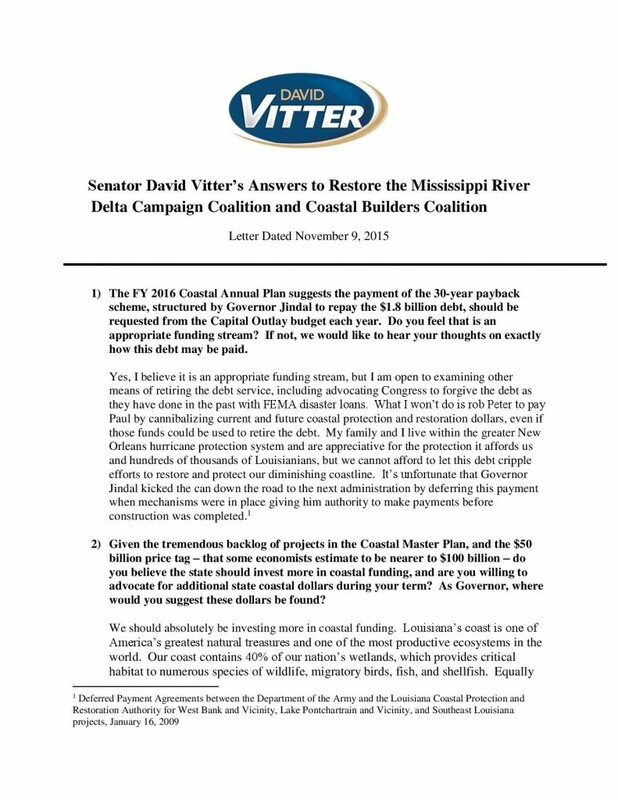 Official response from David Vitter. Click to download PDF. 1)The FY 2016 Coastal Annual Plan suggests the payment of the 30-year payback scheme, structured by Governor Jindal to repay the $1.8 billion debt, should be requested from the Capital Outlay budget each year. Do you feel that is an appropriate funding stream? If not, we would like to hear your thoughts on exactly how this debt may be paid. Yes, I believe it is an appropriate funding stream, but I am open to examining other means of retiring the debt service, including advocating Congress to forgive the debt as they have done in the past with FEMA disaster loans. What I won’t do is rob Peter to pay Paul by cannibalizing current and future coastal protection and restoration dollars, even if those funds could be used to retire the debt. 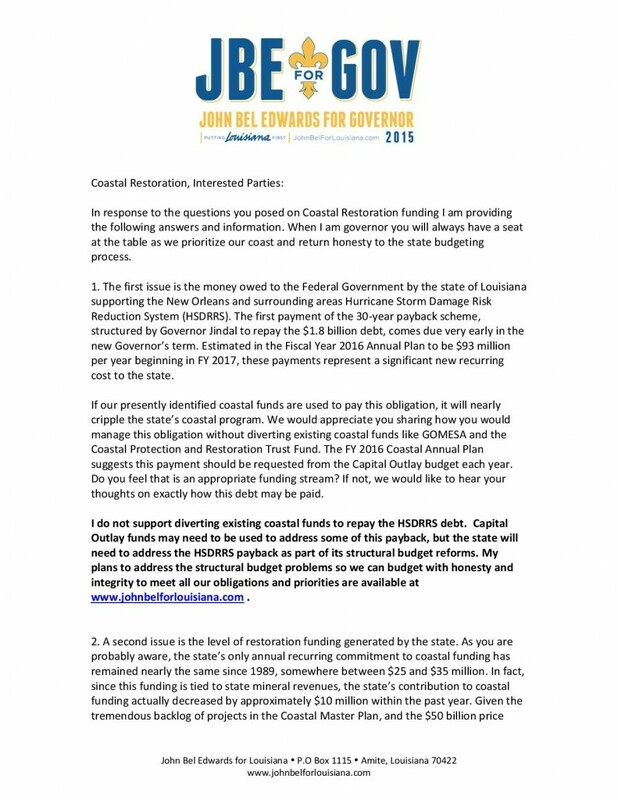 My family and I live within the greater New Orleans hurricane protection system and are appreciative for the protection it affords us and hundreds of thousands of Louisianians, but we cannot afford to let this debt cripple efforts to restore and protect our diminishing coastline. It’s unfortunate that Governor Jindal kicked the can down the road to the next administration by deferring this payment when mechanisms were in place giving him authority to make payments before construction was completed. 2) Given the tremendous backlog of projects in the Coastal Master Plan, and the $50 billion price tag – that some economists estimate to be nearer to $100 billion – do you believe the state should invest more in coastal funding, and are you willing to advocate for additional state coastal dollars during your term? As Governor, where would you suggest these dollars be found? We should absolutely be investing more in coastal funding. Louisiana’s coast is one of America’s greatest natural treasures and one of the most productive ecosystems in the world. Our coast contains 40% of our nation’s wetlands, which provides critical habitat to numerous species of wildlife, migratory birds, fish, and shellfish. Equally important is the fact that our coast is a “working coast” and the foundation of Louisiana’s economy. It supports employment opportunities across several business sectors – energy, maritime, industrial, and fisheries – so Louisianians can provide for their families. Louisiana’s coast is also the #1 reason our state is called the “Sportsman’s Paradise.” Our bayous, wetlands, and coastal waters are home to world-class fishing and hunting. Whether employment or enjoyment, our coast is the lifeblood of Louisiana and its restoration is critical for the survival of Louisiana’s economy and culture. We have all the tangible tools to effectively execute our coastal restoration efforts now and for generations to come, but what we need, in addition to sustainable funding, is leadership to aggressively push those efforts forward for a resilient coastal ecosystem. 1) Lead a coalition of Governors, including from Alaska, Virginia, the Carolinas, Georgia, and the Gulf Coast, to push the feds to expand and accelerate offshore leasing and revenue sharing, producing more American energy and revenue for both the federal government and producing states. 2) Bridge the gap between wetlands mitigation and the Coastal Master Plan. We need to push mandated mitigation where it’s need the most – our coast. In order to do this, we have to strengthen our state’s In-Lieu Fee program, which is essentially the state’s mitigation bank. I was instrumental in pushing the Corps to approve the state’s current in-lieu fee program, but we need to greatly expand the program and include proposed mitigation projects in the Coastal Master Plan or have them complement existing ecosystem restoration projects. 3) Develop an aggressive, organized campaign to raise substantial private matching funds from energy and other leading businesses and non-governmental organizations, which would serve as lead sponsors of specific ecosystem restoration projects in the Coastal Master Plan. We must encourage those businesses or organizations that call Louisiana home or do business here to compliment the state’s investment in ecosystem restoration projects along our coastal landscape. Finding additional revenue sources to fully implement the Coastal Master Plan takes strong leadership, and as your Governor, I will be a leader who is hands-on and aggressively push to protect the money we have and find the money we will need. Thank you, and God Bless Louisiana. To see what the candidates said at CRCL’s Coastal Issues Forum, click here.